Jim Jarmusch is a filmmaker I admittedly know little about. The only one of his previous films I have seen is his 2005 effort Broken Flowers which I only rented once it hit video store shelves because it featured a Bill Murray performance that was receiving grand reviews. I'd like to see more, sometime at least, as Jarmusch seems a stubborn yet eclectic artist willing to try his hand not only in different kinds of stories, but films that share a kinship with his overwhelmingly high standard of influences. I don't know this for a fact and I can't tell you any visual clues I picked up on in the composition of certain shots in Only Lovers Left Alive, but what I can see through the writing of these characters alone is that our writer/director is not simply attempting to make a statement on his perception of what has become the quickly deteriorating society of our modern world, but also the way in which art progresses, innovation is scary yet necessary and how almost nothing besides ideas, creation, expression and any other words used to describe the essence of being artistic are really worth anything when the sun goes down on ones life. Jarmusch intends to teach his audience this lesson and re-assure his targeted hipster audience that there is nothing wrong with remaining spiteful of everything that is popular while he parades around one of the more popular actors in the world at the moment to somewhat hypocritically say that as long as they still have credibility, the fame doesn't count. The fame shouldn't count, I agree, but you can only feel fully vindicated in your plight of pursuing a life, not simply a career, in the arts if you become noticeable enough to make a living off of your talent. It is understandable and to be of the line of thinking in which our main character Adam (Tom Hiddleston) is here where he consistently downplays or demeans the merit of what one naturally wants under the construction of today's society is only saved by his rare, mythic condition. This suggestion one should rather not have their work recognized, but simply remain underground so it never loses that edge of credibility impossible to re-gain once deemed a sell-out. I doubt Jarmusch will ever "sell-out" in the way he likes to defend his independence by never taking a big-budget studio movie on, but his characters who simply trade pretentious dialogue to prove how credible he still is are nothing if not a bunch of jaded, cynical beings waiting for an end that will never come. 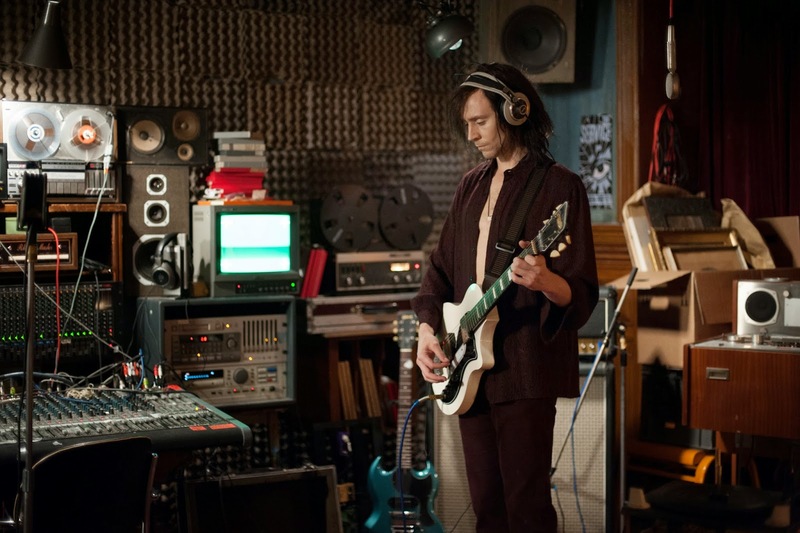 Adam (Tom HIddleston) makes music on one of his now rare instruments. 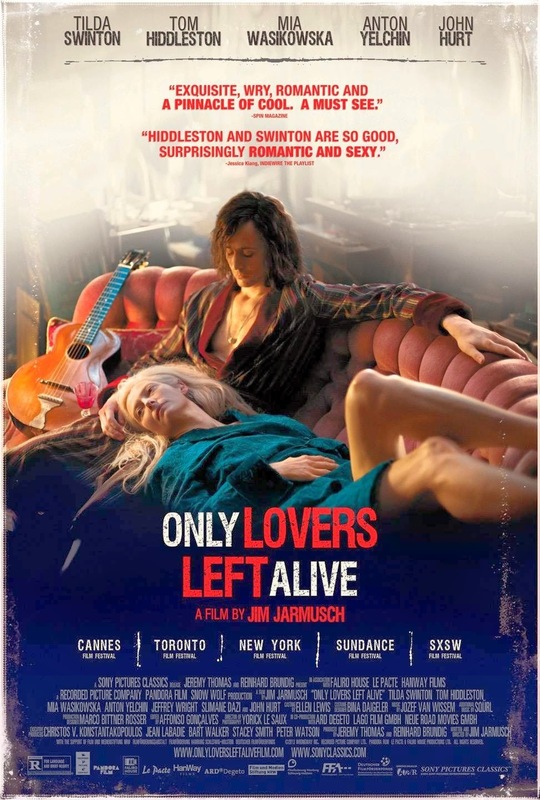 While the ideas of Only Lovers Left Alive are broad in that they amount to more than just a commentary on artistic culture these are the themes most relevant and the ideas I picked up on most frequently as, and this may just be my cynical perception (I'm not exempt and I realize that), they seem to be the ones the director is most keen on getting across to a society he has his main character un-affectionately refer to as "zombies". The film opens with circular shots above our two central characters, slowly descending upon them, no doubt emphasizing the cyclical feeling of the extended lives they have experienced and as it draws closer to their faces with their eyes closed we see in them a kind of realization, that despite the idea of forever everything must have an end and just as the camera draws closer, so does the stop of the seemingly never-ending circle. You see, our "protagonists" if you want to call them that, are vampires. They are vampires in the most common sense of the word, no strange additions made to the rules these kinds of characters have abided by since their inception (no glistening skin) though like the Simon Pegg film Paul, it seems they only follow these rules because they have influenced the perception of vampires in mainstream culture. They wear sunglasses anytime they go outside, they sleep all day and can presumably be killed by wooden bullets as Hiddleston's depressed Adam so specifically requests one near the beginning that it must only mean he is finally considering offing himself. Beyond this interesting set-up of vampires existing in the modern world and how that existence might actually go were they to walk among us today is little narrative to actually be found or followed. We meet Adam, we learn of his night to night routine and we meet Ian (Anton Yelchin) who seems to be little more than Adam's go to guy for refills on rare material things that keep Adam's spirits up just enough to keep him thriving as much as he possibly can. The problem is, these periodic visits from Ian that bless him with rare guitars and the opportunity to create more music in which he seems to find his only solace at this point in his being are beginning to run dry of their pleasure. It isn't until the last half hour or so when there is somewhat of a conflict thrown into the otherwise mundane and routine existence of Adam and his wife, Eve (Tilda Swinton), who at this point, refreshingly I must say, looks at Adam's slump as little more than another bump in a road that keeps going and will forever continue to do so with nothing ever proving to be so damaging it becomes conclusive. Speaking of Eve, Swinton has always been an actress odd in not only her choice of roles but in the way she presents herself physically. She isn't repulsive, but instead the complete opposite in that her strange look is so striking you find it hard to look away when she decides to open her mouth, fangs or no fangs. Her voice, like her aura is hypnotic and here she represents the antidote to her Adam's mentality. She is world weary, living on the other side of the globe than her darkly seasoned husband and taking only books when she travels, going through volumes as if it were nothing, absorbing more and more information so that she may not only be the smartest one in the room, but more the courteous academic who may let you talk, but whom even the person at the center of attention will always look to for approval. This is what Adam does it seems, what he needs anyway to validate that his existence is worth preserving for a little longer. Eve packs her bags, leaving the one and only Christopher Marlowe (John Hurt) in Tangier to provide company to Adam in downtown Detroit where they more or less just hang out with one another while Eve attempts to help Adam through what seems to be a regular occurrence every century or so. In this way it is as if Jarmusch is as much making a statement of the influential arts as he is about the way in which human beings view time. Time, a subject that is always progressing, always perplexing and always so difficult to put a finger on what makes the mystery and fascination of its passing nature so interesting is at least given its best shot by two immortal vampires who would need an overwhelming sense of nostalgia to figure out which moment in time they miss the most. The point Jarmusch is trying to make seems to be that this could seemingly be any point in time as Adam talks as affectionately about seeing Eddie Cochran play guitar as he does of romancing Mary Wollstonecraft. It seems as soon as another forty years or so pass Adam will likely look back with the same fondness on what he discovered and what was created in 2014 as he would the even more distant memories of what are now the seventeenth century and the music that was made in that time. It is a similar sentiment that was carried out in Woody Allen's more upbeat Midnight in Paris where the basic idea could be broken down into the time you're given is valued by what you yourself make of it, but Jarmusch pushes it one step further and asks how does one make special what is no longer rare? Ava (Mia Wasikowska), Ian (Anton Yelchin) and Eve (Tilda Swinton) in Only Lovers Left Alive. What he is almost going for is to create this quintessence or perfect example of a quality existence by showing us what one might do if they had hundreds upon hundreds of opportunities to exist. What would we do with the possibilities? The fact he thinks most might become these jaded immortals bored by the thought of eternity only shows his interpretation and thus where the movie takes us, but the fact the film asks these questions gives our minds places to wonder and wander. These ideas are peaked when we hear the likes of what someone like Christopher Marlowe might say of today's society or how someone such as Eve's younger sister Ava (Mia Wasikowska) who has been around for ages still continues to fall into the trappings of current trends. It is when Ava arrives at the haven of Adam that things begin to get out of hand, control of the situation and the people around him is lost and Adam must find a way to cope with integrating himself into this world he believes the humans have contaminated. Both Hiddleston and Swinton are able to pull off the hipster/uber-academic profile with ease because not only do their offscreen personas suggest a wealth of intelligence and insight, but their performances never come off as snobby or narcissistic in the way one might fully expect given the directors intended tone and targets. Hiddleston, for all his natural charisma in playing the plotting antagonist is reserved and stoic here to the point we can hardly read his thoughts were they not written all over every expression. Swinton is a breath of fresh air to her sullen husband and she is nothing short of the quiet mediator between Adam and everything he sees fit to take on as a challenge or foe. It is their two performances that anchor the film and make Jarmusch's experiment in a feature tone poem all the more involving and rewarding as we see Adam and Eve work towards no goal in particular, but simply sustaining themselves so that they might continue to grow intilectually as that knowledge is now all they have to secretly offer the world. Wasikowska is fun in her limited time on screen while what is essentially a cameo from Jeffrey Wright offers an interesting yet fitting explanation of how these guys feed themselves. Only Lovers Left Alive is both meditative and wholly entertaining, it is a fine combination of humor and sadness encapsulated by a monster of legend that, when the curtain is pulled back, makes perfect sense to serve as a surrogate into a piece about the essence of life, knowledge, art and how sometimes waiting can prove to be satisfying while in other instances it's best to just move on.